Antique Bookcases – Storage with Style! 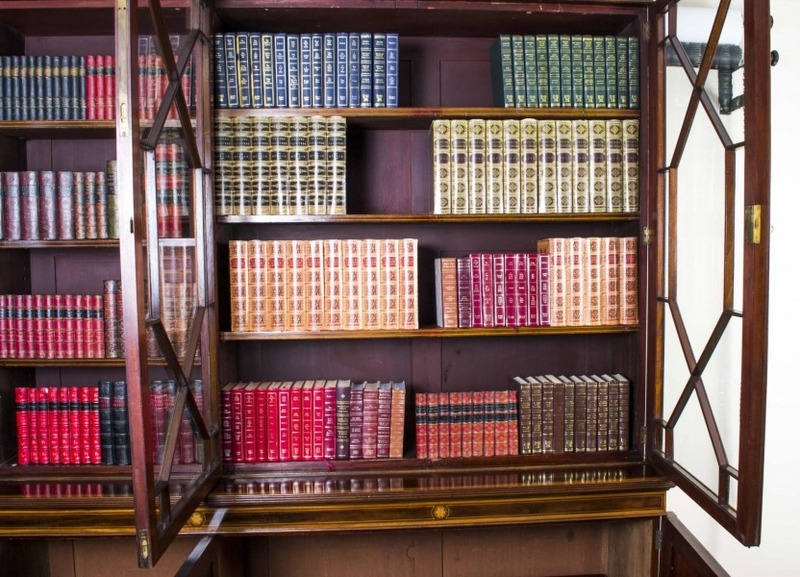 Antique Bookcases – Nothing looks better than a collection of fine quality books all arranged nicely on a shelf – or does it? 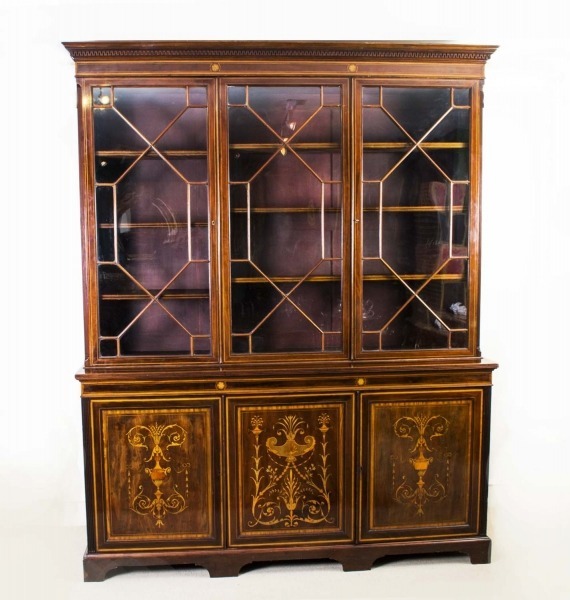 This is an exquisite antique Victorian revolving bookcase which is dated from around 1890 and is attributed to the well known and highly respected retailer Maple & Co who had a Royal Appointment and were one of the leading furniture manufacturers of the Victorian and Edwardian eras. The bookshelf is made from flame mahogany adorned with satinwood, boxwood and ebony marquetry together with crossbanding of classical motifs, paterae and vases. 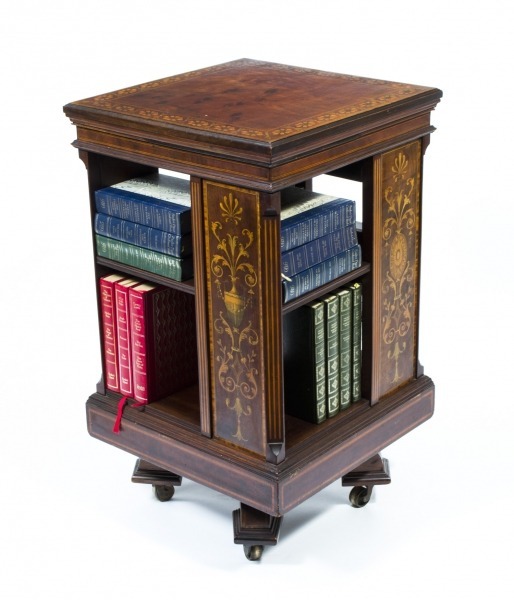 The bookcase is fitted with 8 shelves and is supported by four cabriole legs which have stepped square feet terminating in the original brass castors for ease of movement. Offered for sale, in excellent condition, at just £2850 and available for shipping worldwide – please request a shipping quotation to your destination. Large, capacious, beautiful, functional and versatile – all adjectives that could be used to describe this magnificent bookcase. 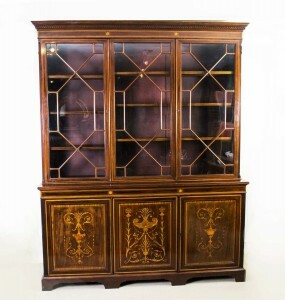 It is an Edwardian flame mahogany three door inlaid bookcase which dates from circa 1900 and which bears the brass plaque of the renowned maker and retailer James Shoolbred. The bookcase features timber with a striking grain, having been made from top quality flame mahogany which is a popular and very attractive material. The bookcase has elegant reeded canted corners, a beautiful moulded canted cornice and it is mounted on sturdy bracket feet. There are three glazed top doors each of which has thirteen pane astragals with satinwood crossbanding and ebony and boxwood outline stringing. 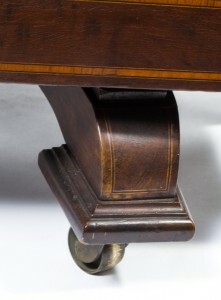 The adjustable shelves inside are also inlaid. 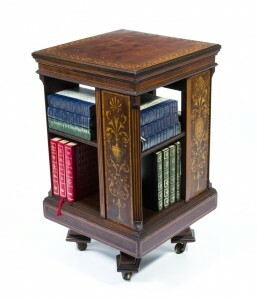 The base of the bookcase sports three paneled doors each of which has with satinwood crossbanding with ebony and boxwood outline stringing together with marquetry floral decoration comprising urns and ribbons. It is supplied with its original shelves, locks, glazing, and a solid mahogany paneled back. On offer for £8250 in excellent condition – the images you see are of the item in its unrestored state and any necessary work will be completed in our workshops before sale. 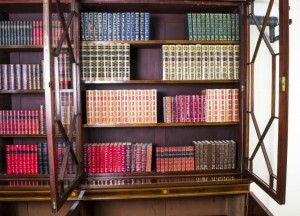 This bookcase measures 237cm high x 194cm wide x 45cm deep, (7 feet, 9 inches x 6 feet, 4 inches x 1 foot, 6 inches). Despite its size we offer to ship to almost any worldwide destination but please request a shipping quotation before making a purchase.